Lomaiviticins A–E (1–5) and the kinamycins (7–9) constitute a small family of natural products which contain a diazofluorene functional group. The kinamycins were first isolated in the 1970s, although the work of several research groups, over a period of nearly 25 years, was required to arrive at the correct structure (as shown). The structures of lomaiviticins A and B (1, 2) were reported in 2001 by workers at Wyeth Pharmaceuticals and the University of Utah. Our group isolated lomaiviticins C–E (3–5) in 2012. The kinamycins and lomaiviticins are potent cytotoxics. Lomaiviticins A (1) is 2–5 orders of magnitude more potent than any kinamycin, and is on average two orders of magnitude more cytotoxic than lomaiviticin C (3). The latter observation is particularly intriguing given the minor structural dissimilarities between the two isolates (structural differences highlighted in blue in 1 and 3). Our laboratory has undertaken the syntheses of the kinamycins and lomaiviticins, with the ultimate goal of elucidating the mechanism of action of lomaiviticin A (1). Toward this end, we developed flexible and general chemistry to prepare the diazofluorene functional group. As shown below, oxidized naphthoquinones (10) and β-(trimethylsilylmethyl)-α, β-unsaturated ketones (11) may be efficiently converted to diazofluorenes (12) of diverse structure by a three-step sequence comprising fluoride-promoted coupling, palladium-mediated cyclization, and diazotransfer. By this approach, over 20 distinct diazofluorenes have been prepared, and the evaluation of the antiproliferative activity of these compounds is a subject of ongoing research in our laboratory. We have adapted this chemistry to the synthesis of (–)-kinamycin F (9). Our synthetic route proceeds in 13 steps from the inexpensive reagent meta-cresol (13). Central to realization of the synthesis was the implementation of two highly diastereoselective transformations for construction of the trans-diol function of the target (14→9). Our laboratory has also devised a synthesis of (–)-lomaiviticin aglycon (6). Our synthesis proceeds by late-stage, stereoselective, oxidative dimerization of two monomeric diazofluorenes (15→16→18). The complex manganese tris(hexafluoroacetylacetonate) (17) was uniquely effective in this bond construction. Deprotection of the fully-protected dimerization product 18 was executed by treatment with excess trifluoroacetic acid and tert-butyl hydroperoxide (TBHP) under carefully-optimized conditions. 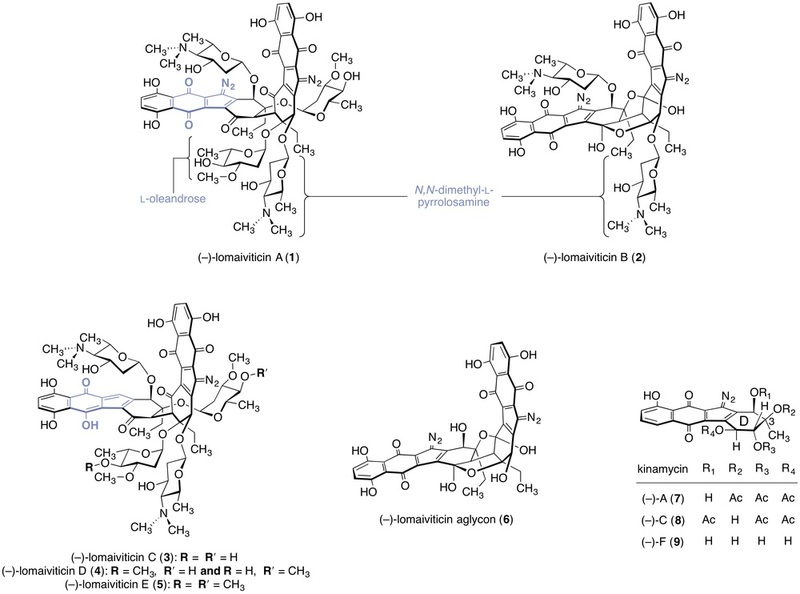 Neutralization at low temperature provided the chain isomer of lomaiviticin aglycon (19). Upon purification or standing in solutions of chloroform-d, the chain isomer converted quantitatively to the ring isomer 6 (39–41% from 18). At the time of isolation, the absolute stereochemistry of the carbohydrate residues of lomaiviticins A and B (1 and 2) was not established. In addition, the absolute stereochemistry of the aglycon substructure of 1 and 2 was also not determined but was assigned by analogy to the kinamycins. We sought to clarify these stereochemical issues in order to facilitate the total chemical synthesis of lomaiviticin A (1). We obtained the producing organism and cultured the bacteria in our laboratory. These studies led to the isolation of three new lomaiviticins, C–E (3–5), for which complete (relative and absolute) stereochemical assignments were made. These studies revealed lomaiviticin C (3) as constitutionally identical to lomaiviticin A (1), save for the conversion of one diazofluorene to a hydroxyfulvene. We developed conditions to effect direct diazo transfer to lomaiviticin C (3), to provide semisynthetic lomaiviticin A (1), which was identical in all respects to natural material. In this way, we may relay our stereochemical assignments from lomaiviticin C (3) to lomaiviticin A (1) and complete the structural assignment, which had remained unresolved since the initial isolation (2001). This semisynthesis provides a viable source of lomaiviticin A (1) for mechanism of action studies. Fermentation yields of lomaiviticin C (3) are high (30–60 mg/L), and the metabolite is amenable to storage. By comparison, fermentation yields of lomaiviticin A (1) are low (0.5–1 mg/L) and the metabolite does not appear to be amenable to long-term storage. Current efforts are focused on completion of the total synthesis of lomaiviticin A (1) and elucidation of the mechanism of action of the natural product. In the 2001 isolation report, it was noted that (–)-lomaiviticin A (1) cleaved DNA under reducing conditions, but no data from this study were published. We have analyzed the DNA-damaging properties of 1 in vitro and in tissue culture, and conducted parallel experiments to elucidate these properties with (–)-lomaiviticin C (3) and (–)-kinamycin C (8). Our data indicate that the cytotoxicity of 1 arises from induction of DNA double-strand breaks (dsbs). This mode of DNA damage is not recapitulated by 3 or 8. The DNA-damaging activity of (–)-lomaiviticin A (1) has been examined in vitro using a plasmid DNA cleavage assay (Figure a below). These experiments established that the metabolite nicks and cleaves plasmid DNA at low micromolar concentrations by a pathway that is independent of hydroxyl radicals, iron, superoxide, or hydrogen peroxide. (–)-Lomaiviticin A (1) potently damages DNA in the presence of reducing agents such as dithiothreitol (DTT) and at high pH, to generate Form II (nicked DNA or single-strand break, ssb) and Form III (linearized DNA or double-strand break, dsb) DNA. The ratio of Form II to Form III DNA is 5.3 ±0.6:1 (e.g., one dsb is produced for every five ssbs formed). A Freifelder–Trumbo analysis (Figure d below) showed that the production of DNA dsbs occurs from a single binding event, rather than from an accumulation of unrelated ssbs. In parallel experiments, Form II DNA was also generated by 3 but not by 8 under these conditions (Figures b and c below). It is interesting to consider the ratio of ssbs:dsbs produced by 1 (5.3:1) in the context of reported data for bleomycin (6:1; Povirk, L. F., et al. Nucleic Acids Res. 1977, 4, 3573) and calicheamicin γI1 (2:1; Drak, J., et al. Proc. Natl. Acad. Sci. U. S. A. 1991, 88, 7464). Bleomycin cleaves dsDNA by a stepwise process (without dissociation from the binding site), while calicheamicin γI1 cleaves DNA through a single reactive intermediate. In vitro reactivity and deuterium-labeling studies suggest that the DNA cleaving activity of 1 derives from the formation of vinyl radical intermediates (20) and that the production of these intermediates is more facile for 1 than for 3 or 8. Vinyl radical intermediates may form by nucleophilic addition to the diazo group, followed by extrusion of dinitrogen. This process is outlined below for a thiol nucleophile, but other intracellular agents may also initiate this process. We have conducted an analysis of the DNA damaging properties of (–)-lomaiviticin A (1) in cultured human cancer cell lines. Using a neutral single cell gel electrophoresis (comet) assay, we showed that 1 induces the formation of DNA dsbs at low nM concentrations and in a dose-dependent manner. Neither (–)-lomaiviticin C (3) or (–)-kinamycin C (8) display DNA-cleaving abilities at high (300 nM) concentrations in this assay. By producing DNA dsbs, (–)-lomaiviticin A (1) activates the non-homologous end joining and homologous recombination repair pathways, as evidenced by formation and colocalization of phospho-SER139-H2AX (γH2AX) and p53 binding protein 1 (53BP1) foci and by the hypersensitivity of BRCA2-deficient cells to 1 (see below). Consistent with the results of our comet assay, cells treated with either 3 or 8 did not lead to production of foci derived from γH2AX or 53BP1. In collaboration with Dr. Peter M. Glazer and Denise Hegan (Yale School of Medicine) we evaluated the cell killing activity of (–)-lomaiviticin A (1) and (–)-lomaiviticin C (3) in VC-8 and Peo1 cells proficient and deficient in BRCA2, which is involved in homologous recombination repair. BRCA2-deficient VC8 and Peo1 cells were found to be hypersensitive to 1 (>98% cell kill at 10 pM). We are currently working to analyze in greater detail the DNA damage signaling pathways activated by (–)-lomaiviticin A (1), the nature of the interaction of 1 with DNA, and the molecular mechanisms underlying DNA cleavage. We are also working to synthesize targeted derivatives of 1 for selective cell killing. In collaboration with Dr. Peter M. Glazer and Dr. Ranjit S. Bindra of the Yale School of Medicine, we are exploring several avenues of translational development including: 1. In vivo evaluation of 1 and synthetic analogs against NHEJ- or HR-deficient tumor types; 2. Evaluation of 1 and synthetic analogs in combination with various inhibitors of NHEJ and HR repair; 3. Development of a high-content HTS assay to identify new NHEJ and HR inhibitors. All of these pathways of investigation find their genesis in and are enabled by fundamental studies directed toward the chemical synthesis of the kinamycins and lomaiviticins. Shivajirao L. Gholap, Christina M. Woo, P. C. Ravikumar, and Seth B. Herzon Org. Lett. 2009, 11, 4322. Christina M. Woo, Liang Lu, Shivajirao L. Gholap, Devin R. Smith, and Seth B. Herzon J. Am. Chem. Soc. 2010, 132, 2540. Seth B. Herzon, Liang Lu, Christina M. Woo, and Shivajirao L. Gholap J. Am. Chem. Soc. 2011, 133, 7260. Seann P. Mulcahy, Christina M. Woo, Wei-dong Ding, George A. Ellestad, and Seth B. Herzon Chem. Sci. 2012, 3, 1070. Christina M. Woo, Nina E. Beizer, Jeffrey E. Janso, and Seth. B. Herzon J. Am. Chem. Soc. 2012, 134, 15285. Christina M. Woo, Shivajirao L. Gholap, Liang Lu, Miho Kaneko, Zhenwu Li, P.C. Ravikumar, and Seth B. Herzon J. Am. Chem. Soc. 2012, 134, 17262. Christina M. Woo, Shivajirao L. Gholap, and Seth B. Herzon J. Nat. Prod. 2013, 76, 1238. Laureen C. Colis, Christina M. Woo, Denise C. Hegan, Zhenwu Li, Peter M. Glazer and Seth B. Herzon Nat. Chem. 2014, 6, 504. Christina M. Woo, Nihar Ranjan, Dev P. Arya, and Seth B. Herzon Angew. Chem., Int. Ed. 2014, 53, 9325. Seth B. Herzon Synlett 2011, 2105. Herzon, S. B.; Woo, C. M. Nat. Prod. Rep. 2012, 29, 87.